When thinking about safety and security at your business location, you naturally consider such factors as preventing crime and theft. It is vital to prevent break-ins, vandalism and security for your employees, customers and visitors. You can help contribute toward a safe and secure work environment with security guard buildings. Who Can Use A Security Guard Building? Truly businesses of all types can at times face concerns over violence, terrorism and in some areas rampant crime. Failure to provide adequate security places not only the entity, but in some cases individual managers at risk for lawsuits if it is deemed that there was inadequate security if an incedent occurs. A guard booth, or guardhouse, can greatly reduce that risk. How can secure guard buildings from Georgia Portable Buildings, Inc. benefit your work or business location? Most commercial businesses have valuable inventory that cannot be left at risk of theft or destruction. Depending on the type of business location you have, there may be advantages to considering a security guard building. Multiple types of businesses tend to benefit from posting a security guard at a booth or guard post in order to maintain a position of watch, even during less busy hours of operation, particularly at night. Depending on the budget of your company, a minimalized security guard building can be a smart solution. 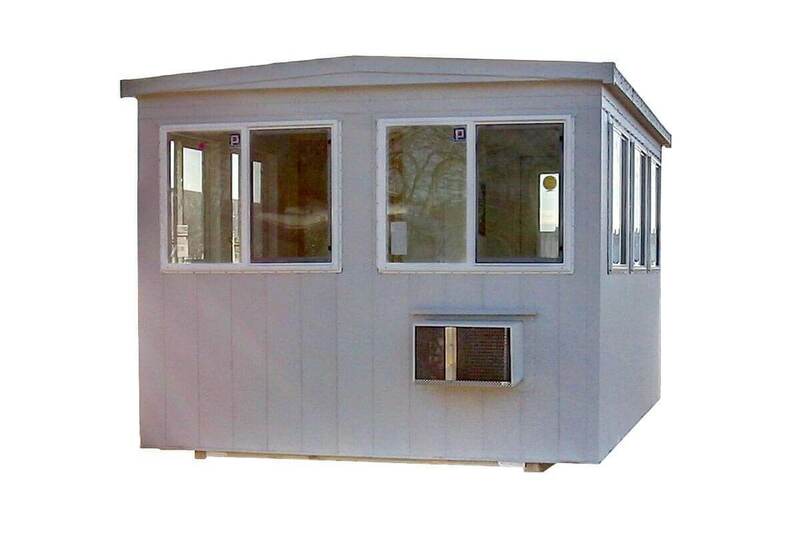 The 4x6 guardhouse from Georgia Portable Buildings, Inc. is the smallest available and quite economical while still offering adequate shelter to house a security staff member. There is room for a security guard to sit and stand plus space to open a window to check tickets or check at a security gate situation. This is a setup suitable for one person and it will save a company a lot of money while still providing a ticket booth or security guard building. 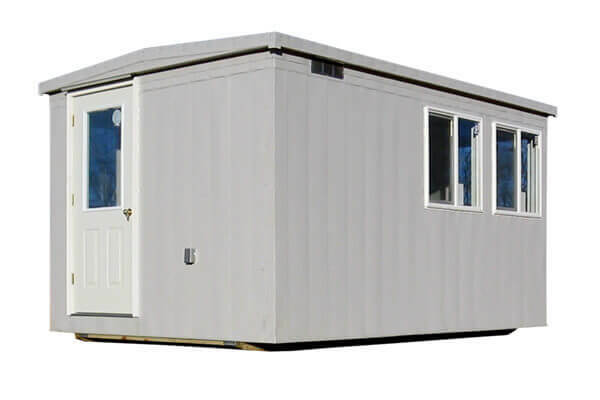 There are many other prefabricated security guard buildings available in sizes which can be customized to suit the needs of your specific location. Some business locations need a small security guard building for just one guard. Other companies need a building suitable for a staff of two, three or more officers. Some locations need just one building and some need more than one in order to be in direct communication with each other. The latter situation may come into play on a construction site, for instance. If a very large construction project is under way and it comes to the close of the day, the site management wants the entire location secure. Along with other forms of on-site security such as lighting, fencing, and traffic barriers, amanned security guard building can greatly improve security for your project or facility. Certain types of businesses have a need for a security guard building to be permanently stationed inside a warehouse setting. You may need a portable office inside your large warehouse. A guardhouse can work great. Or, you may need an office type interior structure for personnel screening, materials check in or inventory control. Again, since our guardhouses are portable, they can be easily moved as the material needs or layout of your facility change. Of course, the exterior setting is the more popular one for a security staff member to occupy. Our security guard buildings are designed to function well inside or outside. Our security guard buildings are designed to handle the elements year-round such as wind, rain, snow, sleet, scorching sun, and even blowing sand in a desert type environment. Already Have Your Own Guard Building Layout? 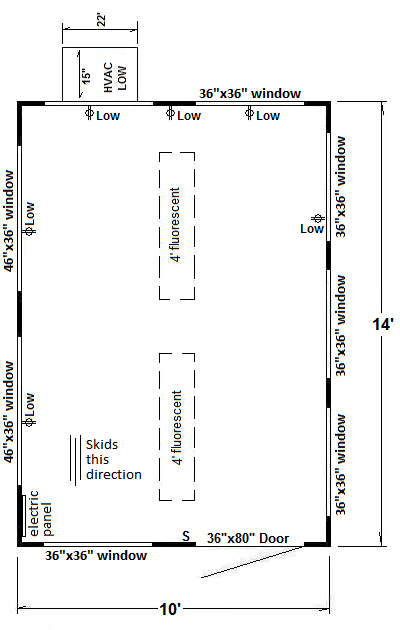 If you need to create your own size and layout of security guard building, we are more than willing to work with you. If you need to place an electrical panel in a certain location or if you need very specific wiring or lighting, all of these things can be accommodated. If you need to have a restroom installed, this can easily be accomplished and is quite popular. Customizing security guard buildings is something we are very happy to do. We will work with you until the building is just the way you want it to be. Past clients have commented that from start to finish, we want our customers to be satisfied with the product and the experience. Remember: The cost of stolen materials and vandalism can quickly exceed the cost of a guardhouse. There is little doubt that a properly designed layout for your next manned guardhouse can be a strong deterrent to crime and theft. Need An Incredible Security Guard Building? Why A Portable Guard Building? Georgia Portable Buildings offers custom security guard buildings designed to withstand the structural forces of being completely portable. Most of our units are movable by forklift. This is a really good option in the event on-site moving becomes needed, such as when a business makes changes or grows. Another possibility for on-site moving is when a business has inventory changes, expanding or undergoing temporary changes. There may be occasions where there is a need to move their security department to other areas. With the use of a prefab security booth that can be moved where added security is needed you can fulfill your companies needs seamlessly. If your needs change and you want to expand, requiring additional security guard buildings, your company could connect them wirelessly for effective communication between staff members. SSecurity guard buildings can be a great way to cut costs for businesses. How can the buildings cut business costs? The security buildings can allow a company to have their own security staff on site in order to keep the location safe and secure. A manned guardhouse and security guard buildings are a very effective way to deter criminals and thieves while not having to put a large sum of money paying several employees to accomplish the same task. A night guard or watchman with properly placed and lit security guard buildings can be just as effective without having to hire and manage a completely separate security staff. Advancing technology allows for endless monitoring possibilities with security guard buildings. CCTV or closed circuit television makes it possible for guard staff to watch many locations on the premises in order to keep safety at its highest levels for your business. The buildings allow a security guard staff member to watch CCTV comfortably and safely within a security guard building, all monitored from one location. Without a doubt, though, these security guard buildings in addition to any other types of technology or guard staff for protection of a business premises are highly recommended for the prevention of crime in today’s society. Just make sure you plan for an adequate amount of space for the monitoring equipment you plan to install. Modular guard buildings from Georgia Portable Buildings, Inc. are a cost-effective way to prevent crime and damage to your property while providing high visibility and maintaining a clear view for your security staff. TThey are sturdy, well made and completely portable. 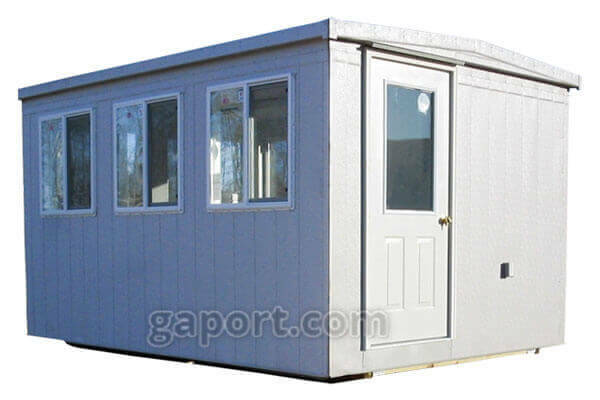 The guard buildings can be customized in a countless number of ways and made from small to large, narrow to wide in a wide variety of colors. They can be built with air conditioning, heating, extra lighting, windows, special doors, you name it. The security guard buildings can be moved in the future if the need arises, and they are built with quality materials and workmanship, delivered by a company you can trust with 27 years in the business. An excellent and low cost way to reduce the chances of crime while increasing the safety and security of your staff. The safety and security of your business, its location, your team and all that is important to you depend on your ability to manage them. Part of that is how much you put into their quality of security and safety. It really does matter how safe your employees feel. 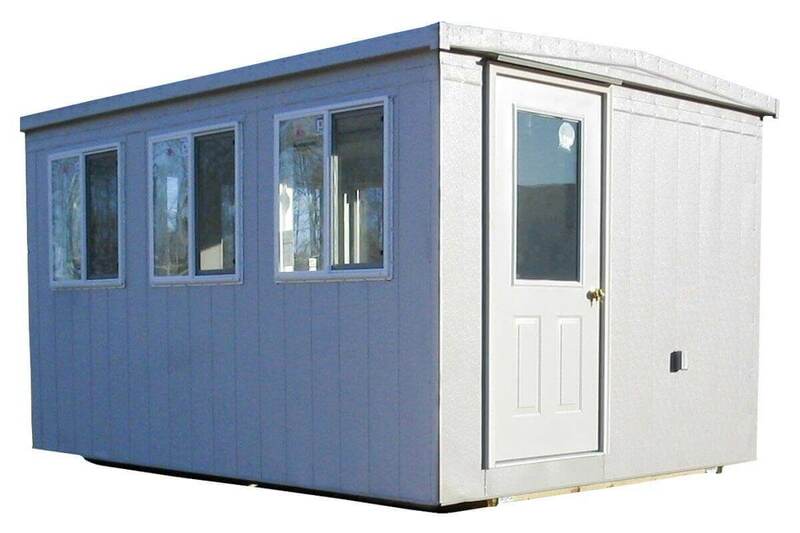 Check out the security guard buildings prices that Georgia Portable Buildings has to offer.